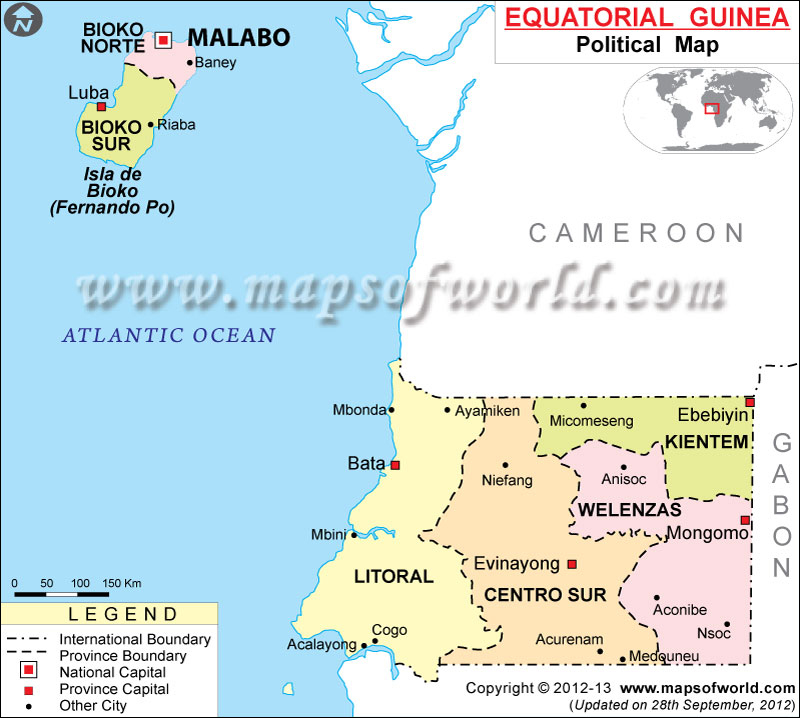 Equatorial Guinea political map helps to locate the important locations of Equatorial Guinea. It is situated in Western Africa between Gabon and Cameroon. It is divided into two main regions namely continental and insular. The insular region has the capital city of Equatorial Guinea named Molabo. Equatorial Guinea is located in Western Africa between Gabon and Cameroon. It borders the Bight of Biafra. Located on the geographical coordinates of 2° N latitude and 10° East longitude, Equatorial Guinea covers an area of about 28,051 sq km. It has got a coastline measuring 296 km. Pico Basile is the highest point of Equatorial Guinea located at an elevation of 3,008 meters above sea level. Equatorial Guinea political map shows the states and important cities of Equatorial Guinea. Equatorial Guinea is divided into two regions namely continental and insular. The insular region is known as the island of Bioko or the Isla de Bioko. On this island is located the capital city of Equatorial Guinea named Molabo. It is represented on the Political Map of Equatorial Guinea by a red square. The capital city is located on the coordinates of 3° 45' North latitude and 8° 47' East longitude. The two important places of this island are Bioko Sur and Bioko Norte. Luba is the capital of Bioko Sur. Baney in Bioko Norte and Riaba in Bioko Sur are the two important cities of the island of Bioko.